How new policing methods have, for the moment, dampened workers' struggles. In October 2010 a new Industrial Police Force (IPF) became operational in Bangladesh. After years of refusal, reluctant to provide the extra funding, the government finally agreed to demands of the garment manufacturers and established a permanent paramilitary force to deal with workers unrest in the industrial zones. The widespread strikes and riots of the previous years, ongoing since the mass revolt of 2006, had also prompted the state's initiative. In particular the 2010 wage protests, where thousands of workers began to move beyond their suburban industrial belt into the city and trashed a wealthy commercial and diplomatic area of Dhaka, were a warning sign of how things might develop. The ready made garment (RMG) industry's central role in the national economy (employing approx. 3.5 million workers, 85% female and earning $12.59 billion from garment exports in the last fiscal year, around 80 per cent of total export income) made essential the need to commit to suppressing the class struggles in the industry. Apart from simple increased productivity, it remains essential to try to improve reliability of supply for foreign buyers; the fast changing world of fashion and its short 'seasons' means fast turnaround and delivery times are key to profitability. For Western companies concerned about maintaining a clean Corporate Image it's also necessary to quieten and conceal workers' public complaints and actions about sweatshop conditions and low pay. Offering an attractively obedient and low paid workforce to potential foreign investors in the Economic Processing Zones (EPZs) meant stopping the unrest. “The garment sector is one of the key industries that keep the country’s economy growing. But a bunch of workers have been trying to destroy this industry for long,” she said, adding that the IPF would rescue industries from the clutches of these vested quarters. 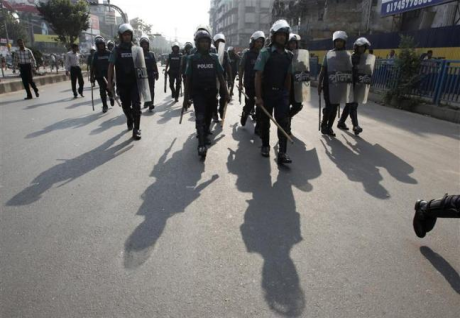 ... in and around Dhaka 3,000 workers fought cops and blocked roads – while the Chittagong EPZ was forced to close as 4,000 workers battled police. As clashes intensified police fired 600 rounds of rubber bullets, 150 teargas canisters and made numerous baton charges. Workers replied with missiles and sticks; roads were blocked with burning and vandalised vehicles while 11 factories and 20 other commercial buildings were ransacked. "The job of the industrial police would be counseling, rather than normal policing. They must give advance information and they must grow trust through their activities," he said. BGMEA set up a control room in its office to monitor the overall activities of the garment factories. Two members of the police and one member of intelligence agency will act as coordinator round the clock. The 3,000 IP personnel are divided between four industrial zones across the country; Dhaka zone-1 Ashulia, Dhaka zone-2 Gazipur, the southeastern port city of Chittagong and at Narayanganj a few miles south of Dhaka. The most decisive tactical innovation appears to be the permanent stationing of the IPF within the industrial zones; whereas previously the police had to travel from the city centre out to the garment factory areas now they can implement a much more rapid response and contain incidents in one workplace area before they spread. Whereas it would previously be the norm for striking workers to leave the factory and then quickly march to neighbouring workplaces to picket them out, the IP are now more often forewarned of trouble via intelligence reports and so can quickly deploy to isolate protests - if necessary, augmented by other police departments and presumably using a form of what we know in the UK as 'kettling' to contain workers' demonstrations. They can then play their mediating and counselling role to encourage negotiation and resolution of disputes between bosses and workers in individual workplaces. (Crowd psychology techniques appear to be an increasingly routine weapon in the arsenals of police forces of the world.) And so the garment workers' long tradition of picketing out nearby workplaces - a practical application of the class-wide solidarity of "an injury to one is an injury to all" - is, for the moment at least, broken. The practical common identity as a class, above and beyond identification or loyalty with a particular workplace, is suppressed. The paramilitary/counselling IPF unites the carrot and stick approach; in the absence of functioning trade unions on the job (which bosses still refuse to allow) the IP takes a surrogate role, playing a role normally reserved for unions; the mediating of conflicts between exploiter and exploited. Md Rafiq, an official at the BGMEA labour unrest cell said deployment of industrial police in major clothing making areas helped to improve the situation. Abdus Salam, director general of industrial police told the FE: "In many cases we are working as arbitrators between the workers and owners to address the grievances and ensure smooth production in the factories." These tactics seem to have worked well so far for the ruling class. The IPF claim a 60% reduction in incidents of RMG worker unrest in the past year and emphasise the value of both intelligence gathering and conflict mediation in this success. Imposing such institutional mediation is intended to kill the explosive spontaneous responses to grievances that have long characterised the struggles of garment workers and their strengths. Their immediacy and contagious solidarity is stifled and dissipated by the time lag involved in negotiation procedures and quickly quarantined within individual workplaces by the paramilitary rapid response of the IPF. But while garment bosses are expecting bumper profits the workers are seeing wages lagging far behind inflation, with rocketing food, fuel and housing costs. With many RMG workers living hand to mouth, the necessity to struggle collectively for material needs is as strong as ever, and strategies to overcome the new policing methods will surely begin to evolve. 2] BGMEA - Bangladesh Garments Manufacturers & Exporters Association. Great article as always Red. Yes, great article. And yes I had wondered if much had been going on their recently. It's very unfortunate that these tactics appear to be working. I would have thought that a paramilitary police force whose primary role was to attack workers wouldn't have much legitimacy as an arbitrating force as well, as it would be clear to the workers what side they were on. I would have thought it would be more sensible for the government to have a secondary agency (like ACAS in the UK) which they just sent in at the same time but with a different name. On the arbitration, however, how does that work between workers and management. Does that mean that this police force does talk to the employers as well, and have the employers had to give anything in in this period? Has unemployment also gone up in this period, due to the crisis? If so, it may be that that has had more impact than the police repression… Do you think that's a possibility? I would have thought that a paramilitary police force whose primary role was to attack workers wouldn't have much legitimacy as an arbitrating force as well, as it would be clear to the workers what side they were on. The IPF is a new force - established from the start to play a dual hard cop/soft cop role, but emphasising in their publicity and training that mediation/counselling techniques are meant to be primary where possible, supplemented by force where necessary. (Who knows,maybe they've been influenced by modern UK academic theories on the psychology of policing...) So the main point of the article is to show the dual nature of the IPF control mechanism, the carrot and stick of soft and hard, mediation and force - one complementing the other in varying proportions as necessary. The impression I have is that - depending on whether intelligence reports have already prepared cops for a workers walkout - the force quickly establishes strict physical limits to workers protest and mediation is established by the IP between bosses and workers over disputed terms and conditions. I've previously argued that allowing garment unions in the workplace would be "sensible" and in their own interests for the bosses - but they're not always the most rational in their choices (or there may be other factors we're not aware of); as said above, in the unions' absence the IPF are playing a kind of 'surrogate' mediating role. On unemployment; the only apparent effect of the global crisis so far is that projected RMG growth this year is less than last year, but is still at 15% (down from 40%). As I showed at the end of the article the garment industry feeds an expanding export market with cheap essentials; rising wage demands in China have led to a shift of some production to cheaper Bangladeshi firms, increasing their market share in both Asia and the West. Last year's 50% drop in cotton & yarn prices also helps profits. I've seen no evidence, in over 5 years, of rising unemployment in the industry; quite the opposite.